UNITED NATIONS (Reuters) - Russia sent home nearly two-thirds of some 30,000 North Koreans working there during 2018 and China repatriated more than half of those employed there but did not specify a figure, according to unpublished reports by Moscow and Beijing to the United Nations Security Council. The one-page reports, seen by Reuters on Tuesday, were submitted to the council's North Korea sanctions committee in compliance with a 2017 resolution that demanded the repatriation of all North Korean workers by the end of this year to stop them earning foreign currency for leader Kim Jong Un's government. The United States has said it believed Pyongyang was earning more than $500 million a year from nearly 100,000 workers abroad, of which some 80,000 were in China and 30,000 in Russia. The U.N. Security Council has steadily toughened sanctions on North Korea since 2006 to choke off funding for Pyongyang's nuclear and ballistic missile programs. U.S. President Donald Trump and Kim have met twice in the past year in a bid to negotiate denuclearization. The December 2017 U.N. resolution required countries to report to the sanctions committee this month on all North Korean workers repatriated during 2018 "including an explanation of why less than half of such" workers were repatriated if applicable. Russia reported that in 2018 the number of North Koreans "with valid work permits in the Russian Federation decreased from 30,023 to 11,490 persons." Key North Korean ally China said it had repatriated "more than half of the total DPRK nationals earning income." "China will continue earnestly implementing its international obligations, carry out the repatriation work in an orderly manner and complete the repatriation on time," wrote China's Mission to the United Nations, adding it did not want the report to be made public. 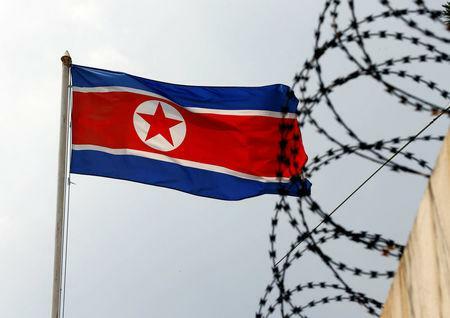 The United Arab Emirates told the Security Council committee it had sent home more than half of the North Koreans earning money in the country during 2018, repatriating 823 people. It did not say how many North Koreans were still in the country. Poland reported that in December 2017, 451 North Koreans were working there and that number had dropped to 37 by the end of last year. Some of those 37 might have already left Poland by crossing the European Union's external border in another country, it added. In 2015, Marzuki Darusman, a U.N. human rights investigator, said the North Koreans abroad worked mainly in mining, logging, textile and construction. The reports submitted by Russia and China to the sanctions committee did not specify what industries had employed the North Koreans. New York-based Human Rights Watch said in a 2017 report that "the treatment of North Korean workers overseas falls short of international labor standards, with no right to freedom of association or expression, control by minders who limit freedom of movement and access to information from the outside world, long working hours and no right to refuse overtime." North Korea has said its laborers were working abroad legally and were not mistreated or forced to go.